7/7 Cup of Coffee: The PawSox blew a lead in extra innings, Matt Barnes was forced to leave the game after the first batter of the game hit a line drive off his right wrist, and Greenville split a doubleheader with Savannah. Cleuluis Rondon (pictured) hit a go-ahead grand slam in the ninth to give the Spinners a thrilling victory. After the PawSox took the lead in the top of the tenth, Pedro Beato blew the save, as the Rochester Red Wings (MIN) beat the PawSox, 3-2. The PawSox got on the board quick, as Will Middlebrooks drove in Jackie Bradley, Jr. in the top of the first, but they would not score again until the 10th. Rochester scored a run off Anthony Carter in the eighth to tie it after failing to score in seven innings off starter Steven Wright. In the top of the 10th, Alberto Rosario laid down a squeeze bunt to score Justin Henry, giving Pawtucket the lead. In the bottom of the inning, Beato gave up a single to tie the game, and then a fielding error by Henry allowed the winning run to score. Bradley went 1 for 2 with three walks, and Xander Bogaerts went 2 for 3 with a walk. Matt Barnes left the game after only one batter, as the Sea Dogs fell to the Rock Cats (MIN), 9-4. The first batter of the game lined a pitch off Barnes' right wrist, and after a couple of warm-up pitches, he was pulled from the game. Kevin Thomas of the Portland Press Herald tweeted that Barnes did well on the strength tests, but he will be re-evaluated tomorrow. The early exit of its starter put an extra strain on the Portland bullpen, as three relievers combined to throw all nine innings. Miguel Celestino was the most successful, throwing three shutout innings without allowing a hit. Garin Cecchini raised his average to .412 by going 3 for 4 with a double, and J.C. Linares went 2 for 4 with a double and an RBI. A five-run fifth inning propelled the Carolina Mudcats (CLE), who beat Salem, 7-2. After Deven Marrero singled in the top of the fifth to tie the score at two, the Mudcats responded with five runs in the bottom of the inning. Miguel Pena gave up three hits to start the frame, and he was replaced by Matty Ott, who gave up three hits of his own. In all, the Mudcats sent nine men to the plate in the inning, as they effectively put the game out of reach. Seven different Red Sox batters had a hit in the game, with Henry Ramos slugging a home run and Stefan Welch adding a double. Marrero went 1 for 3 with a walk, but also committed his second error of the season. In the first game of a doubleheader, the Savannah Sand Gnats (NYM) got the best of the Drive, winning 3-0. The game was scoreless until the top of the seventh, when Savannah got to Drive reliever Gerardo Olivares for three runs on three hits and a walk. Justin Haley started for the Drive and tossed five scoreless innings, though he did walk five without striking out a batter. Mookie Betts and Drew Turocy each went 1 for 2 with a walk to lead the offense. The Drive came out on top in game two, winning 3-1. Luis Diaz pitched a complete game, allowing one run on three hits, while walking one and striking out six. Diaz has been on a roll his last three starts, giving up only one run in 20 1/3 innings, with opponents collecting only nine hits and striking out 21 times. With the score tied at one in the sixth, Kevin Heller hit a two-run double, and Diaz got the Sand Gnats to go down in order in the seventh to secure the win. Cleuluis Rondon hit a go-ahead grand slam in the top of the ninth, as the Spinners beat the Tri-City ValleyCats (HOU), 4-3. It looked like it was going to be an easy win for the ValleyCats, who were up 3-0 heading to the ninth. The Spinners only had two hits in eight innings, but after Manuel Margot and Aaron King singled and Carlos Asuaje walked in the ninth, the ValleyCats were forced to go to the bullpen. Rondon greeted the new pitcher with a grand slam that gave the Spinners their most exciting win of the season. Mario Alcantara allowed one earned run in the first four innings, and Joe Gunkel picked up his first professional victory by throwing two scoreless innings of relief. Tzu-Wei Lin went 1 for 4 and has now hit safely in 11 of his last 12 games. The GCL Red Sox dropped to 6-6 on the season, falling to the GCL Twins (MIN), 6-5. Keivin Heras was not sharp, surrendering four runs on five hits in 3 1/3 innings, but Enfember Martinez kept the Red Sox in the game with 3 2/3 innings of one-run relief. Down three in the seventh, the Red Sox tied the game after Jon Denney, Bryan Hudson, and Wendell Rijo walked, and then Jantzen Witte drove them all in with a triple. The Twins scored a run on a home run in the eighth that proved to be the game-winner. Denney went 1 for 2 with two walks in his second career game, and Witte went 2 for 4 with a double and the triple. Rijo went 2 for 3 with a double, a walk, and three runs scored, and he has now scored 11 runs in 11 games. An unearned run was the difference in the game, as the DSL Astros (HOU) beat the DSL Red Sox, 1-0. Luis Ramos was the tough-luck loser, allowing only the unearned run in five solid innings, while walking none and striking out three. 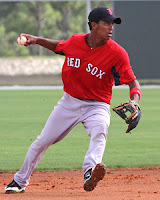 Victor Acosta went 2 for 4 and Franklin Guzman went 3 for 4 to lead the Red Sox. Player of the Day: Hitting a grand slam when your team is down by three runs in the ninth is pretty much the ultimate way to have a come-from-behind victory. Even though he had just one hit, Cleuluis Rondon made it count. The 19-year-old has been playing second base while Tzu-Wei Lin gets most of the playing time at shortstop, but Rondon is more than capable of playing either middle infield position. After hitting only .149 in his first nine games, he is now batting .455 in his last six, with two walks and three extra-base hits.